Zeus, the Lord of Heaven, is an intelligence hero commonly played in the solo mid or offlane positions. Based entirely on the god of thunder from Greek mythology, he shocks his targets with white-hot bolts of lightning and sends thunder reverberating across the battlefield wherever he may be. Zeus is a hero that has an almost-singular role, thanks to his potent spells that deal incredible magic damage. He serves mainly as the semi-carry for the team, blasting enemy heroes with Arc Lightning and Lightning Bolt, his two non-ultimate abilities. Arc Lightning jumps from target to target, dealing minor magic damage to each one without losing its power along the way. Lightning Bolt, on the other hand, comes down hard on a single target, dealing up to 350 damage in one go. To complement his two main nukes, he has his passive ability Static Field—which causes additional damage to enemy units within a 1200 unit radius whenever he casts spells. This damage is based on a percentage of their health, which can be as much as 10 percent when Static Field is at max level. This ability alone means that Zeus retains his destructive capabilities well into the late game, rather than simply falling off once enemy heroes acquire more health and/or magic resistance. And finally, there is his signature ability—one that strikes fear into the hearts of newcomers to Dota 2 and sends shivers down the spines of killstealers everywhere: Thundergod’s Wrath. Upon activation, Thundergod’s Wrath conjures lightning straight onto every enemy hero on the map, dealing as much as 425 magic damage upon hitting them. Zeus’ ultimate gives him global presence and the ability to assist his teammates regardless of where he is on the map. Thundergod’s Wrath can also be used to scout the enemy team, instantly revealing their positions. And of course, its primary purpose is to deal massive damage during five-on-five engagements, softening up each opponent to make things easier on your own team. For all his godly powers, though, Zeus does have several key weaknesses that can be easily exploited. The most obvious one is that he lacks a long-duration stun or disable—which, coupled with the fact that he has no built-in escape mechanism, means that he is basically dead to rights if he is caught out of position. His low strength and agility gain certainly don’t help him with his fragility, either. He is also very, very mana hungry, particularly in the early to mid game. But because of how easy it is to play as him and his immense snowball potential, Zeus can easily take over games on his own. If your team needs a strong magic damage dealer that can do so from long range (or anywhere on the map, for that matter), look no further than the Lord of Heaven himself. Because of his terrible attack animation and almost non-existent attack range, Zeus relies almost entirely on Arc Lightning to score last hits in the lane. While this does have the unfortunate consequence of pushing the creep wave towards the lane opponent’s tower, it’s really his only way of getting any farm reliably. Knowing this, it should be where your first skill point goes. Even though Lightning Bolt is a far stronger nuke, its long cooldown and high mana cost means that it isn’t efficient at all. Arc Lightning is all you need for fighting the creep score war in the mid lane, so it’s definitely what you should get first. That said, it is meant to be left at Level 2 through the early game, so don’t sweat it so much. Which brings us back over to Lightning Bolt, the ability that you’ll be maxing out first. Lightning Bolt is your best hero harassment tool, aside from Arc Lightning. It deals a crapload of damage to your lane opponent, and even has the bonus of giving you True Sight if cast on the ground. The latter helps you get rid of any Observer Wards that might be giving your opponent high ground vision, so if you have mana to spare try to do so to deny vision. Because of its multiplicative scaling, Static Field should definitely be left for last. Its impact is massive in the late game, but practically nonexistent in the early game. Thundergod’s Wrath, on the other hand, should be skilled into at every level, in order to get it to maximum damage as soon as possible. For the most part, Zeus’ item build will consist of things that give him more stats (both health and mana), more magic damage, and some actual mobility. Essentially, his inventory will be filled with items that double down on his intended role and design, while shoring up weaknesses where they can. To start with, we recommend saving up for a Bottle and a pair of Arcane Boots in the laning phase. Both items will keep your mana topped up as long as you can contest the runes, and will supply you with more than enough casts of Arc Lightning and Lightning Bolt to get you through the early game. Clarity Potions also help in much the same way, though of course depending on your lane opponent it might get canceled by long range damage. After obtaining these two items, you can then make your way towards a Blink Dagger, a Veil of Discord, or an Aghanim’s Scepter. Blink Dagger allows you to initiate from almost any angle, as well as escape ganks if you have the reflexes to blink out before the enemy heroes hit you. The added mobility is always nice regardless, though. Veil of Discord turns you into a powerhouse of magic damage, with unprepared teams folding under the might of your spells. Meanwhile, Aghanim’s Scepter gives you Nimbus, an additional global ability that zaps targets with Lightning Bolt every 2.25 seconds in the affected area. Needless to say, Nimbus is one of the most irritating abilities in the entire game, and can help kill fleeing stragglers alongside Thundergod’s Wrath. It also has scouting utility, being a unit with flying vision. Once you have an Aghanim’s Scepter, it becomes very unsafe for the enemy team to attempt to kill Roshan without picking off a few of your teammates first. From there, it’s pretty much all situational and luxury pickups. Octarine Core works extremely well on Zeus, reducing his cooldowns even further when taken alongside the appropriate Level 20 talent. You also regain some health whenever you deal spell damage, which can help you survive protracted teamfights. You might also want to purchase a Ghost Scepter, in case any physical damage dealers are giving you trouble. Refresher Orb can help seal the deal against a team that’s already behind, thanks to the double Thundergod’s Wrath and double Nimbus that it gives you. If there are no other suitable carriers on your team, you may also opt for Scythe of Vyse for its powerful disable. Shiva’s Guard, on the other hand, gives you more nuking power in a large area, while also hampering right click carries with its passive aura. Nothing exemplifies how simple it is to play Zeus more than his combo, which is incredibly easy to remember and pull off even in the most heated engagements. Generally, you’ll want to start off by hitting a key target with Lightning Bolt and Arc Lightning, boosted by Veil of Discord if it is present in your inventory. Follow up with Thundergod’s Wrath and/or Nimbus, which should be enough to kill assuming your teammates assist you with their own damaging abilities. Rinse and repeat for the next targets, making sure to stay out of harm’s way in the process. Note that Thundergod’s Wrath and Nimbus are great ways of preventing the use of Blink Dagger, which you should absolutely abuse against teams that depend on the item. Heroes like Earthshaker, Tidehunter, and Tinker hate going up against Zeus for this very reason, so try your best to prevent them from getting a jump on your team. Zeus’ fragility and lack of mobility make him a prime target for gank specialist heroes. 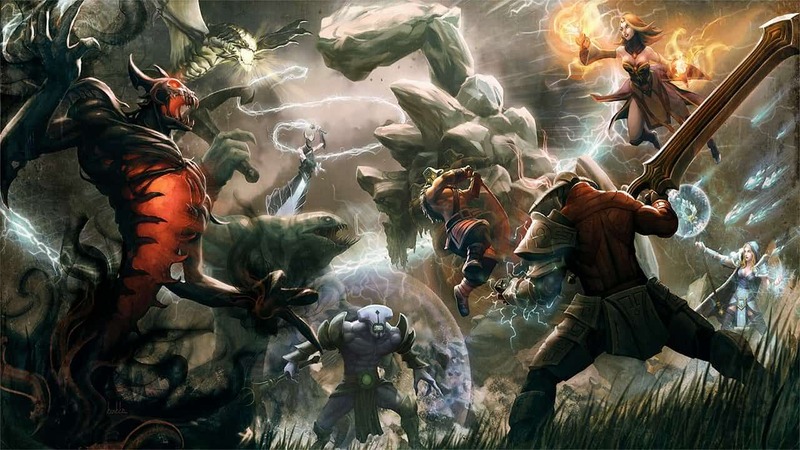 Nyx Assassin, Bounty Hunter, Faceless Void, Huskar, Storm Spirit, and the like can jump him or get up to him stealthily, either through their own abilities or with items like Blink Dagger. Nyx Assassin in particular counters everything that Zeus can dish out, thanks to Mana Burn and Spiked Carapace. To prevent him from getting the momentum he needs, gank Zeus early and often. In the late game, heroes like Anti-Mage can use his mana consumption and mana pool against him. Magic immunity is also one of the best ways to deal with Zeus, as he lacks a way to deal damage through it. Black King Bar will prevent him from touching you entirely, and so will Omniknight’s Repel. Barring that, things that block magic damage or increase magic resistance help tons against him, so have one of your supports or the offlaner purchase a Pipe of Insight for your team. Orchid Malevolence carriers feast on Zeus, who can silence him before he has a chance to retaliate with his abilities. Without access to his nukes, he becomes a total sitting duck, and will eventually fall to the damage amplification at the end of the debuff duration. And speaking of silences, they are Zeus’ worst enemy next to magic immunity, and completely neuter his effectiveness. Be careful, however, that you do not pour all your silences onto him if he has a Eul’s Scepter of Divinity—as this item allows him to purge it off. On the other hand, Blade Mail can be used by tanky heroes, in order to punish him for using his spells in the first place. This also turns Static Field against Zeus, who won’t appreciate losing 10 percent of his health from the get-go. By the same token, things such as Lotus Orb and Anti-Mage’s Counterspell can reflect Zeus’ magic straight back at him. While it almost seems like there is no counter to Thundergod’s Wrath, it should be mentioned that Smoke of Deceit is an incredibly cheap way of avoiding it altogether. Thundergod’s Wrath reveals invisible heroes on cast, but does not actually damage them. Assuming that none of Zeus’ allies are near your team, you can potentially save your teammates from disaster with a measly 50 gold if you time Smoke of Deceit properly.